We’ve seen it all in Winter’s Spite, or at least so it seems. The Dark Souls universe has put forward both an atmospheric and maudlin tale in this latest series. It shouldn’t come as a shock when I say that it’s been my favourite series by Titan Comics thus far. So it’s hurting me to see it conclude in this fourth and final issue. 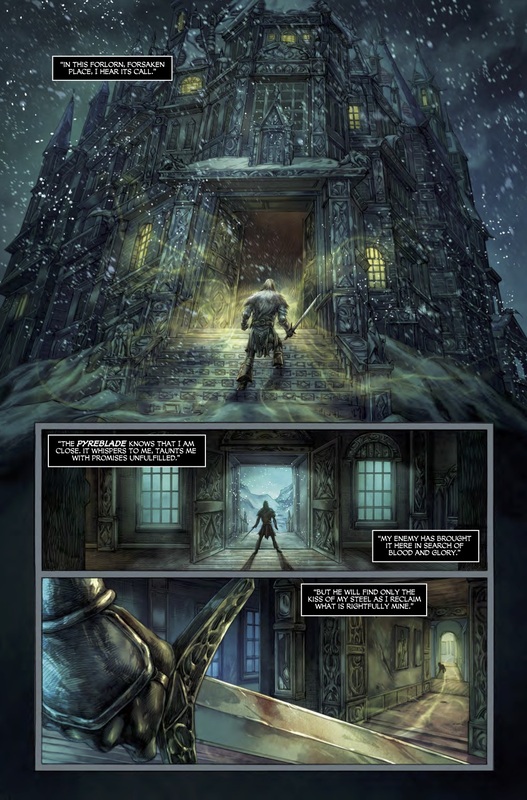 The comic starts with a recreation of issue 3’s closing scene: Andred at the doors of Lady Parnethia’s fortress. He speaks of the pyreblade – the sword that he searches for – saying that it calls to him. He knows that the sword and the knight he hunts are inside. Andred enters the castle. Venturing down its melancholy halls, he encounters a foul chest-like monster that series veterans will immediately recognise as a mimic. He is, of course, caught unaware by the monster but after a lengthy struggle manages to strike it down. And so he pushes on. between the two is somewhat unnerving; Andred’s interest seems to be purely with his Uncle’s sword. That night, as his uncle sleeps, Andred is possessed by the pyreblade’s call. He murders his uncle and his aunt, taking the blade for himself. Over these frames the comic darkens, returning to its previous melancholia. Andred finally makes clear his desire for the pyreblade: it clears his memory of these crimes. 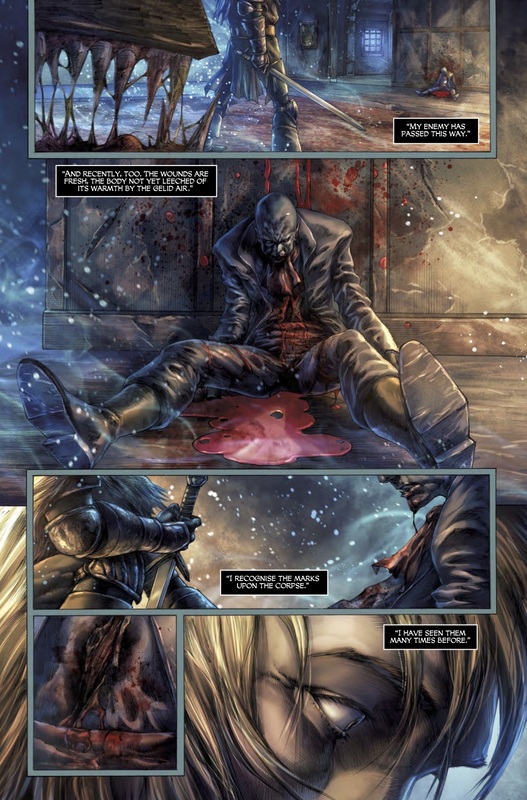 As the comic returns to the present time, Andred continues through the fortress until he is finally, face-to-face with Parnethia. I’d like to take a moment to commend the artists because they did a magnificent job of creating and framing this woman of renowned beauty. The frames in which she appears are truly breathtaking. But there’s little time to admire the scene; Duke Ettinger disturbs the solemn moment between Andred and the lady. Andred comes to blows with the Duke, but Lady Parnethia employs some supernatural magic to strike destroy Duke and his men. man who wields the pyreblade, the same man that Andred pursues. The fight between the two is lengthy, and as it transpires, Parnethia watches on. 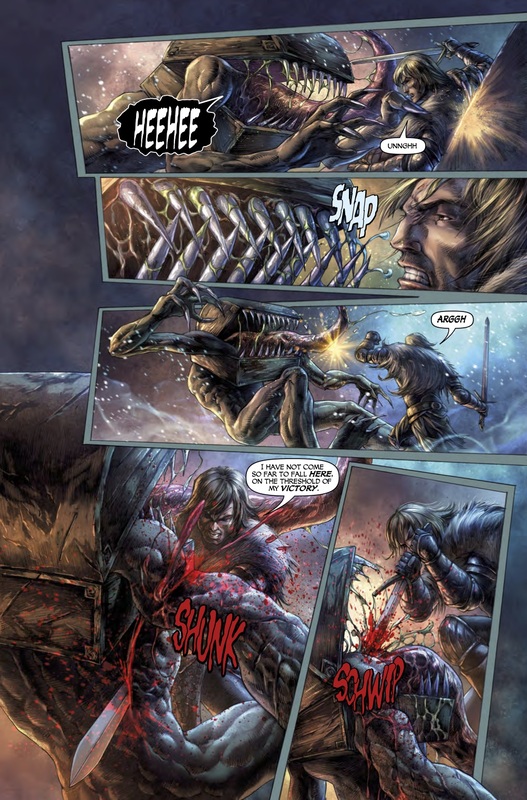 But eventually, Andred stands the victor holding his sword to the nameless knight’s throat. Here, it is revealed that the nameless knight aimed to kill Lady Parnethia and that the pyreblade was the only weapon that allowed him to do so. Predictably he makes a final lunge at the Lady, but Andred strikes him down. In the closing scene of the series, Parnethia offers Andred a place by her side. But our protagonist declines – he learned in the previous issue of the tragic ends that Parenthia’s formers lovers had faced. Andred ventures out into the frozen wasteland once more, this time with his birth-right in his hand. Lady Parnethia assures us that he will return, and promises to reserve for him a place in Winterspite, the name of both this series and her domain. And so concludes another Dark Souls comic series and it seems as the quality of these comics is only increasing. Winter’s Spite offered the most entertaining and absorbing story so far. Andred’s tale was long and violent, filled with twists and melancholia. 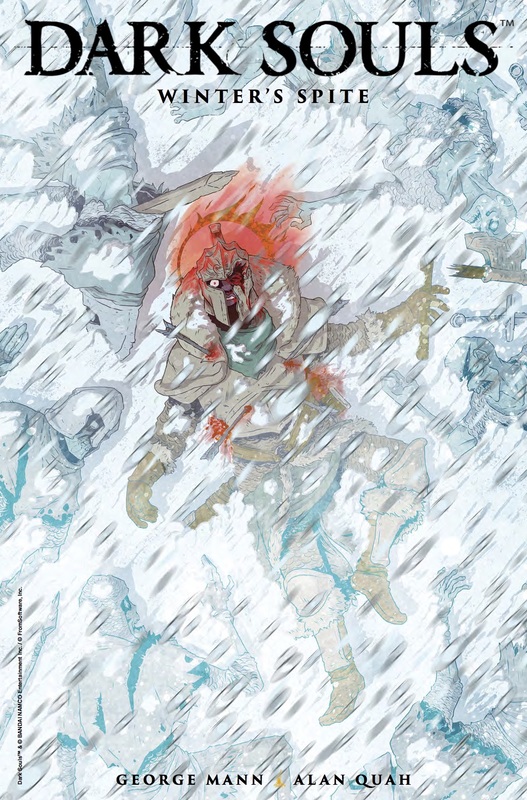 The sadness and the quintessential Dark Souls gloom worked to create a chilling atmosphere that made this series one of Titan Comic’s most captivating reads. I’ve hardly done it justice with these reviews and summation, for the comic’s success is dependent upon its dazzling artwork and ambience. This series is one of the first to make full use of the comic book medium and in doing so it creates a truly rewarding reading experience. As a stand-alone story, or as part of the Souls universe, Winter’s Spite is a worthy investment. Be sure to check it out. Next articleTeam17 add Yoku’s Island Express to their games label. Set for release on Xbox One, PS4, Switch and PC.